Once again the talented team at Golem! 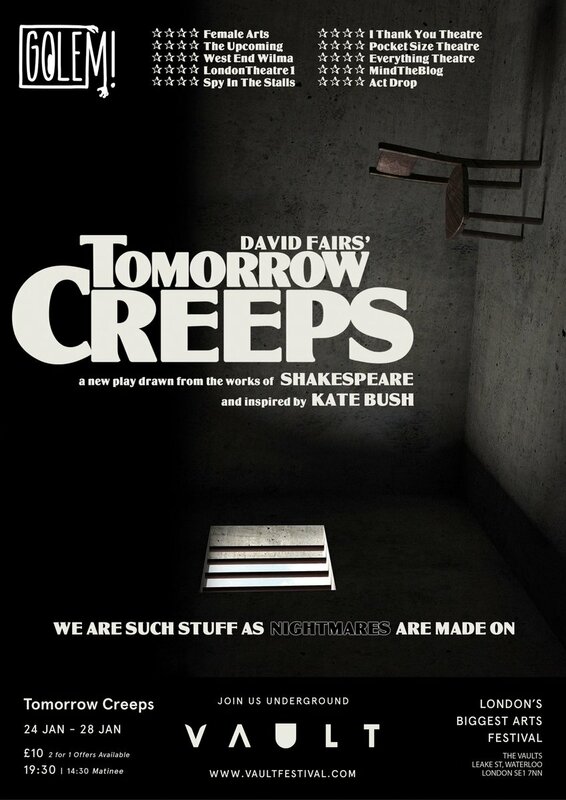 Theatre is at their creative best with David Fairs’ new play Tomorrow Creeps, premiering as part of the Vaults Festival from 24 January 2018. Following the successes of Macbeths (2016) and I Know You Of Old (2017), GOLEM! 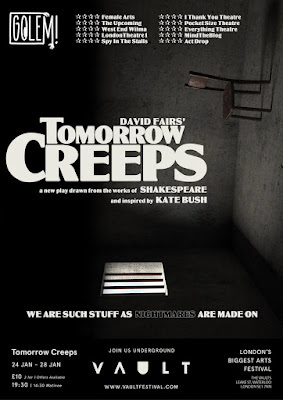 return to push the boundaries of adaptation yet further with Tomorrow Creeps, a new play orchestrated from sixteen Shakespeare texts and inspired by the storytelling of Kate Bush. Directed by Anna Marsland (Ballistic at Edinburgh Festival and soon at The King’s Head, Islington) and featuring David Fairs, Conor O’Kane (Offie-nominated for Miss Nightingale) and Zena Carswell (winner of The Origins Award for Outstanding New Work at VAULT festival 2016 for Butter with Lady Junk Theatre), Tomorrow Creeps has been created with the Vaults in mind and promises to be an immersive piece of new theatre. Multi-instrumentalist musician and composer, Odinn Hilmarsson has also designed and created a soundscape to complete the piece. 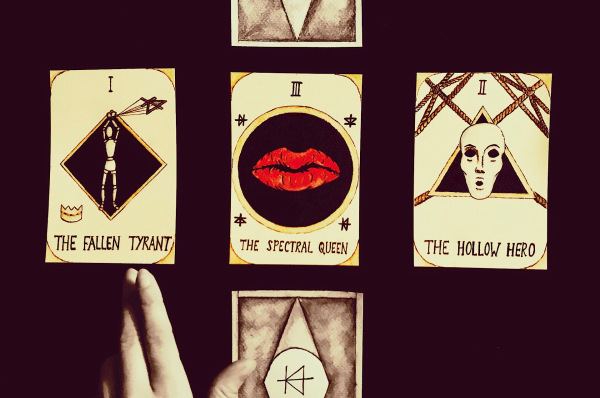 As someone lucky enough to have experienced Golem’s I Know You of Old at the Hope Theatre (and no aficionado of Shakespeare), it was one of the best pieces of new writing that I saw (twice) last year, together with great performances from this innovative and talented company. So, retrospectively, here’s my belated five stars! So roll on Tomorrow Creeps, Babooshka! Let the nightmare begin! Creatives: Producer Sarah Lambie & GOLEM!